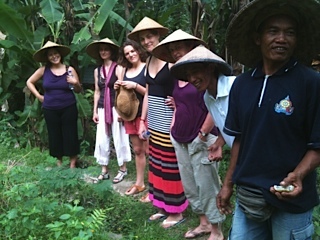 This innovative program blends the core principles of tropical Permaculture gardening with Self exploration from a transpersonal psychological perspective. "Experiencing Permaculture through the heart" presents a unique opportunity to combine class room Permaculture learning with “hands-on” experience, complementing the active physical engagement with the soil with an inner attitude of loving alignment with the earth. The internship is a combination of personal growth processes, allowing our heart energy to flow into our work with the earth, environment, water, soil, plants and people. This program is the first of its kind, working with the psychological framework of the mind, theoretical Permaculture principles, design and planning, planting, harvesting and food preparation - all in alignment with the heart energy. “Permaculture through the Heart” is a modular seminar. You can choose if you want to book the entire program or if you only want to book the 1. and/or 2. week.